Today was Cinders's last day. 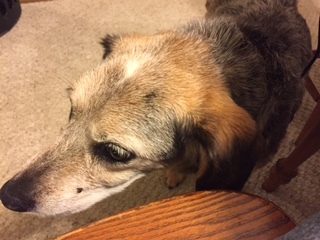 She has been a loving, faithful companion for 16 years and 2 months. I have so many wonderful memories of the times we had together. 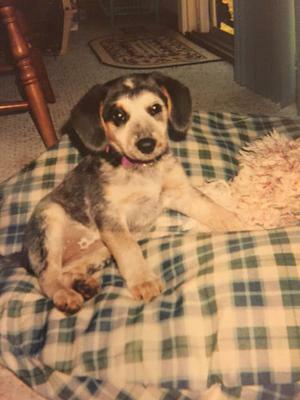 She was about 8 weeks old, barely old enough to leave her mom, when Vanessa, Keith and I went dog shopping and picked her out at the first place we stopped to look at dogs for sale by families. I had promised Keith a dog and we got Cinders for him as promised. However, Cinders quickly became my dog because she lived with me full time and the kids split their time between their dad and me. We were a perfect match. I loved that she was extremely intelligent and very sweet. It almost seems as if she had orchestrated the way her life would end. Vanessa came home to say goodbye to Cinders and spent some cuddle time with her. We then decided to eat dinner on the patio and I carried Cinders outside so she could be with us. Cinders walked around the yard a little while we started to eat dinner. Cinders ended up at the side of the house where we couldn't see her. Vanessa went to fetch her and bring her closer to us so we could keep an eye on her. When Vanessa reached Cinders she called to me that Cinders needed me. I got up and went to them. Vanessa and I quickly realized that Cinders was dying so we lay down next to her in the grass and tried our best to comfort her as she took her last breath. I feel blessed that Cinders died at home in her yard and that I was spared the sorrow of taking her to the vet's office to be euthanized. Those who know me and Cinders know we had a special closeness that not all dogs and owners are fortunate to experience. I know my life will never be the same now that she is gone, but I will make an effort to remember the many ways Cinders has blessed me. I hope that dogs go to heaven and that there is a Rainbow Bridge in heaven. If there is, I know that one day Cinders and I will be together again. I also hope that today when Cinders arrived in heaven, Keith welcomed her with open loving arms.